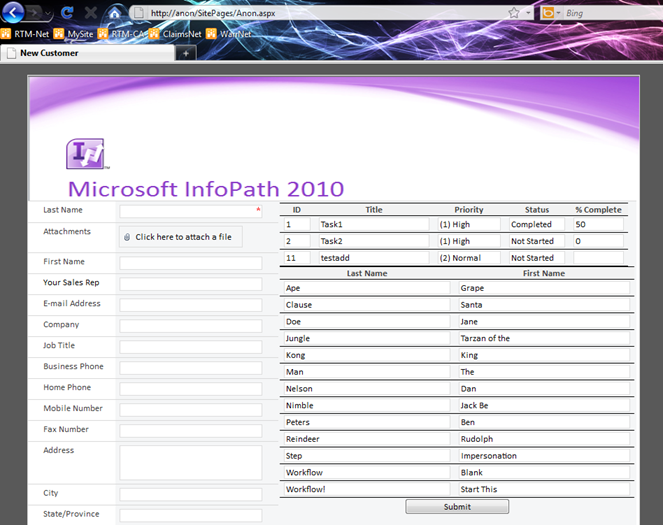 This entry was posted on June 3, 2011 at 12:24 PM	and is filed under InfoPath 2010, Office 2010, SharePoint 2010, SPD 2010. You can follow any responses to this entry through the RSS 2.0 feed. You can leave a response, or trackback from your own site. Clay – This is *similar* to what I mentioned on Twitter the other day. We are at the next hurdle that you mentioned at the end: how to send the email without code. I am convinced that there is no way to complete our anonymous InfoPath form project without code, so we’re looking to use as little code as possible and to make what code we do write as generic as possible so it can be reused easily. I’ll blog about it when we’re done. 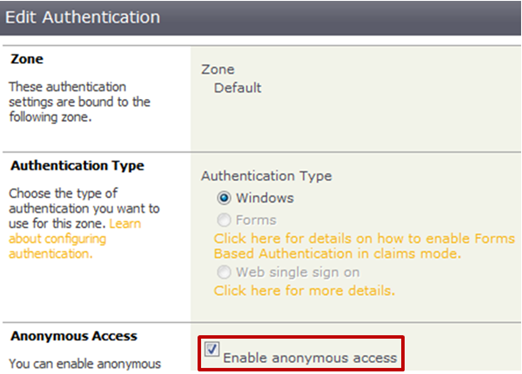 It is a shame that there is not a good end-to-end solution for power users to develop anonymous InfoPath forms. Thanks for posting. 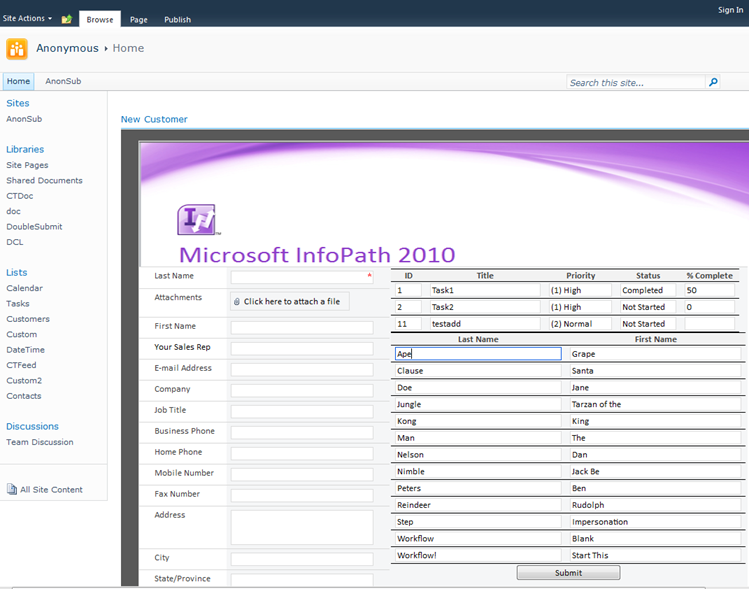 how to Get SharePoint InfoPath Form Search Results to Open in browser? 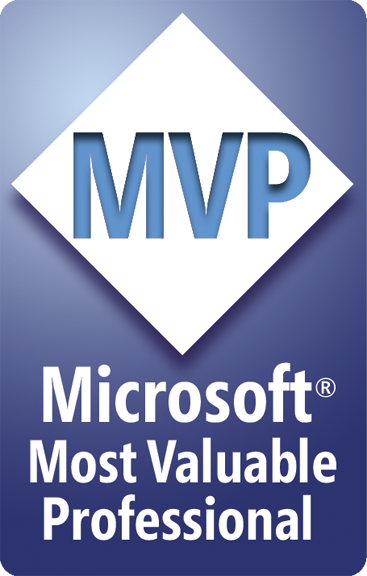 There is no feature for this – it requires customizing the search results web part. Hey Clayton, I found the reason why I did it the way I did it in my blog series. I don’t want anonymous users seeing the list contents. If you notice, you can’t set “Add Items” without setting “View Items”, therefore everyone can see the items in the list, which in my case is undesireable. MIchael, that makes sense, but it wasn’t the reason stated, so now you can mention that as the point of the blog, which was a good one. Michael, btw, if you just set the Item Level Permissions in the Advanced Settings to “read only their own,” then anonymous users cannot see any of the items. That’s about as easy as it gets. 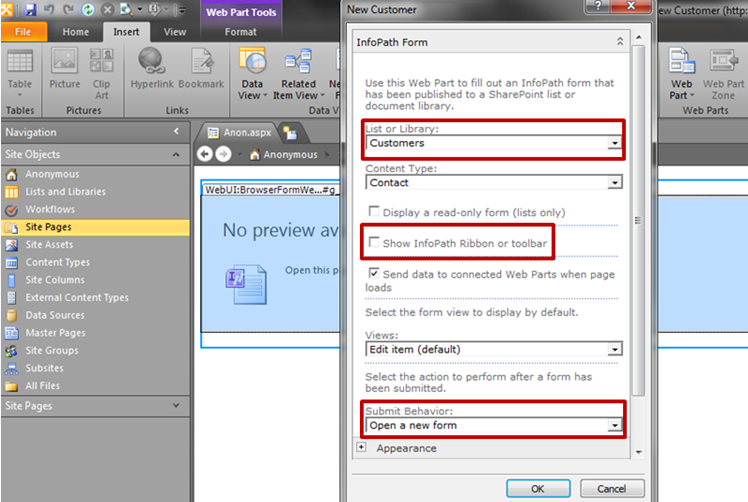 Clayton, when I set “read only their own” the infopath web part displays an error when submitting, although the item is successfully added to the list. Any idea how to get rid of the error message? YOu have to find out what the error is and what’s causing it. Hey just tested using a workflow with an impersonate step to generate an email when a new item is created and it works! Simon, are you sure? I have tried that several times, and it has never worked for me or for anyone I know. 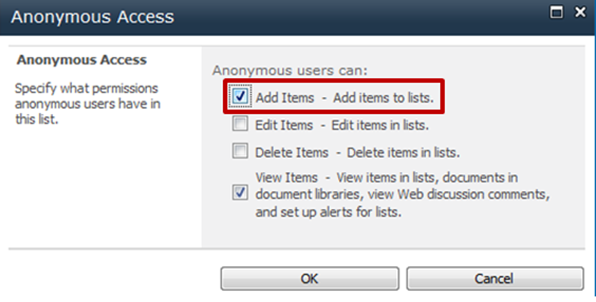 There is no provision for starting a workflow on a list with an anonymous user, so are you sure that’s what you did? Any news wheter Simon got it to work with impersonate ? I am really looking for a solution to this, before putting to much effort in developing our new web with SP, InfoPath, CRM and using BCS! T Binder, I have never heard of it working and have never seen it work. Simon never backed up nor qualified his statement, so I don’t believe it until I see it. A bit shame that workflows can´t betriggered by anonymous in the SP list. But any of you guys knowing if using external list in SP for example against CRM, having the information within CRM, whether CRM then can trigger its workflows? Just came across this post of yours Clayton. Great job in the step by step explanation to this seemingly complex issue that so many people talk about. I’ll definitely be forwarding people to this post.